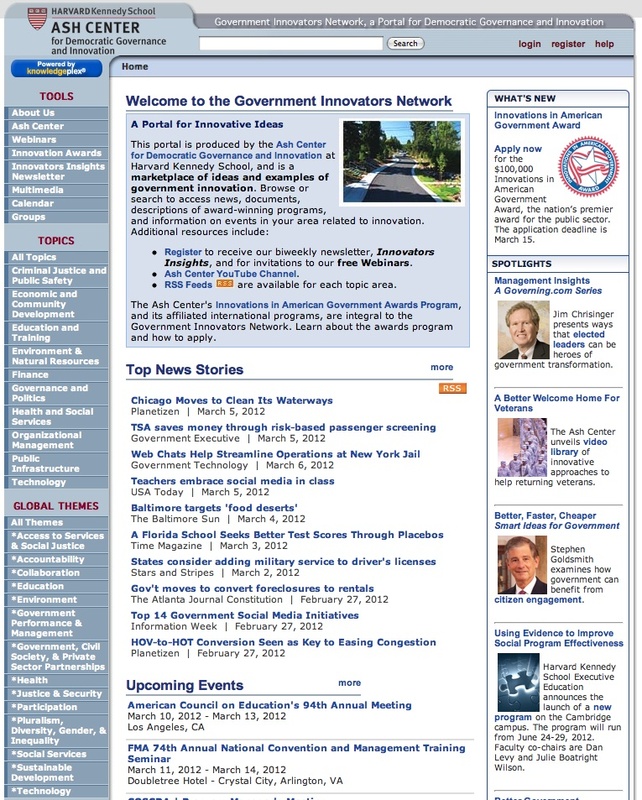 The Government Innovators Network (GIN) is an initiative supported by the Ash Institute for Democratic Governance and Innovation at the John F. Kennedy School of Government at Harvard University. It is maintained by a team of partners from community-based enterprises to national and international organizations. The project wants to stimulate the discourse on the principles and practices of democracy by fostering government and governance innovation. In this respect the GIN portal is conceived as an instrument for policy makers, policy advisors, and practitioners looking for documents, articles, case studies and general information on government and its innovation. Specific areas such as governance and politics, public infrastructure, economic and community development, and technology are particularly rich in contents. This website is structured in topics and themes, each of them providing records and items organized in archives and retrievable in different formats, included multimedia versions. Access to all material and record retrieval are completely free of charge and downloading is possible in different formats. Some audio/video records are accessible only after a free online registration. Users can directly access an item by browsing or search by keywords. The website has a clear interface structure and this allows an easy navigation for all users.